M.I.A. // “Matangi” : new album coming . . .
new song // M.I.A. : "Bedroom to the Hallway to the Road to the World"
Stream M.I.A.‘s latest bit of futuristic bedroom pop art released to the world here. Oct 18, 2010 | Categories:music | Tags: bedroom to the hallway to the road to the world, favorite music, m.i.a., mia, song | Comments Off on new song // M.I.A. 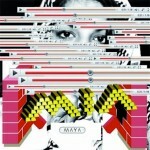 : "Bedroom to the Hallway to the Road to the World"
coming soon // MIA "/\/\/\Y/\"
M.I.A. // /\/\ /\ Y /\ : 2010.07.13 M.I.A. is streaming her new album prior to it’s release on her wigged out myspace page. Jul 07, 2010 | Categories:music | Tags: /\/\/\Y/\, album, coming soon, favorite music, m.i.a., maya | Comments Off on coming soon // MIA "/\/\/\Y/\"
M.I.A. // // / Y / : 2010.07.13 M.I.A. is streaming her new album prior to it’s release on her wigged out myspace page.